Woke up this morning to a nice little surprise. 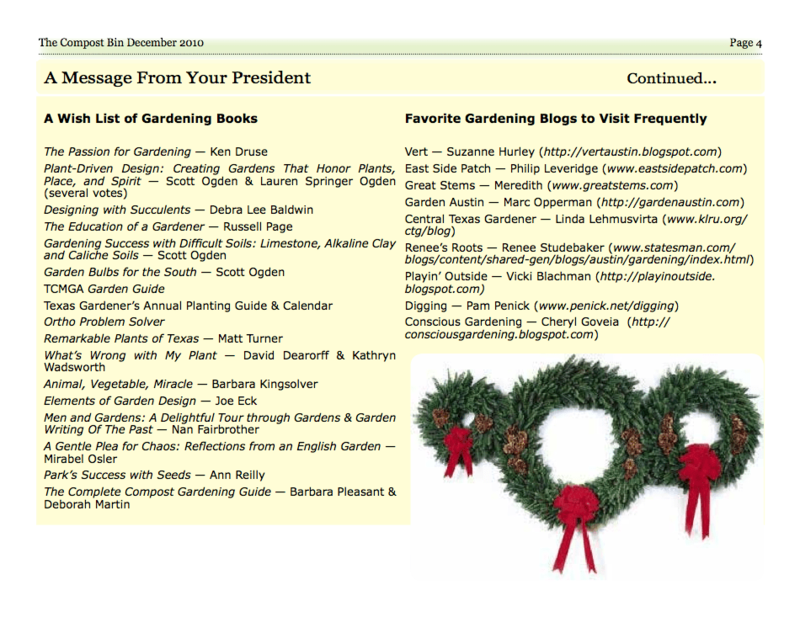 My little ‘blog here was listed in the Travis County Master Gardeners Association‘s newsletter, The Compost Bin, as one of the “favorite gardening blogs to visit frequently.” I am certainly honored, as I have a lot of respect for the master gardeners, and count a few – including Cheryl Harrison who alerted me to the mention – as friends. What’s a little cool to me, too, is that I’m not a certified Master Gardener. I’d love to be go through the Master Gardener training (as well as the cousin Texas Master Naturalist program), but have so far either had conflicts, missed the registrations or had other compelling reasons to miss out (like, oh, having a baby this year). For those not familiar, the Master Gardener and Master Naturalist programs involve weeks of intensive training, both in the classroom and garden/field. Master Gardeners learn all the details of horticulture in Central Texas, both for food plants and ornamentals (as well as soils, pests, composting, water use, etc. ), while Master Naturalists learn the native ecosystem – its plants, its fauna, geology, hydrogeology, soils, invasives, etc. Both programs come with the expectation that you’ll give back to the community in some way and require a certain number of volunteer hours after certification. So, welcome to any Master Gardeners who are new here, and hopefully soon I’ll be able to join your ranks. 4 Responses to "GardenAustin.com Mentioned in TCMGA Newsletter, “The Compost Bin”"
Well I certainly like to come read your blog. I hope you can find the time to get the training and certification. Seems like that would suit you well. Thanks, Monica! I was really touched, actually, by your comment that you liked my FB presence so that you’d know when I updated this site. Ran across your post while doing a search, and I was very pleasantly surprised that my blog was also included on the list. It is a very nice honor!